The Cancun High-level Communiqué, which was the outcome document form the Leaders’ Forum, commits to investing more on resilient infrastructure, including green infrastructure and housing. It further highlighted the impacts of disasters on ecosystems and the importance of risk reduction in achieving social and economic development and environmental sustainability. The Leaders' Forum comprised Heads of State, senior ministers, CEOs, UN Executive Heads and community leaders. A number of sessions focused on the role of ecosystems in building resilience to disasters and climate change, which is a Priority Area in the Sendai Framework. PEDRR, Partners for Resilience (PfR) and the Swiss NGO DRR Platform successfully held its side event on 24 May which featured panelists from Wetlands International, United Nations University, PfR, Netherlands Red Cross, Helvetas Swiss Inter-Coopreration, World Bank, Global Facility for Disaster Reduction and Recovery (GFDRR) and Food and Agriculture Organization(FAO) . Barriers and opportunities for scaling up ecosystem-based solutions were discussed. Panelists suggested that there is need to advocate Eco-DRR solutions that are robust, as well as raise local community capacities to implement Eco-DRR. The Working Session on Ecosystems and Agricultural Resilience discussed how ecosystems, natural resource management and agricultural practices contribute directly to reduced risk, adaptation and enhanced resilience. It examined multi-stakeholder efforts to address challenges to scale up investments in ecosystem-based solutions. Practical measures suggested to scale-up investments in ecosystem-based solutions included: creating incentives, improving community involvement, and mainstreaming into local and national government policies. Are ecosystem-based solutions for disaster risk reduction gaining ground? What can be done to bring these solutions from small pilots to scale? Susanna Tol, Senior Communications and Advocacy Officer from Wetlands International, who was in Cancun, suggests that to overcome challenges, including the lack of investments, it is essential for Governments and stakeholders to become more sensitized in collaborating with each other. Read more here. World Wildlife Fund (WWF) - US has developed a flood risk management guide which emphasizes the use of nature-based solutions to mitigate flood risk. The Flood Green Guide provides practical guidance and tools to understand the local context related to flood risk and implementation of nature-based solutions for flood risk management. The guide is now available for download here. Mangroves have always protected people living in coastal areas. It is no different for the local community from Koh Klang, Thailand. 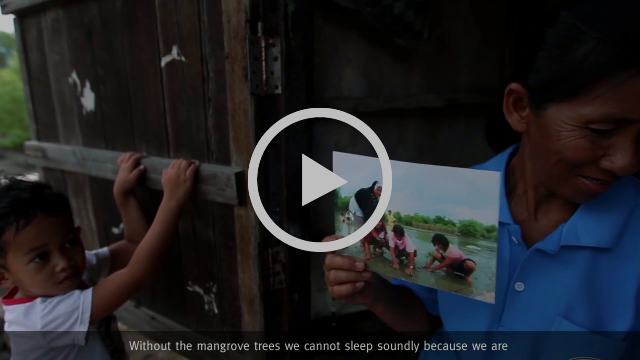 Listen to Khun Nit, a local resident, talk about how mangroves protect them from coastal hazards and enhance their resilience. Wetlands International in the Philippines assessed disaster risks and their impact on local communities and the Agusan River Basin ecosystem. Findings suggested that the river increasingly poses a threat to residents, while at the same time it is losing vital ecosystem services that provide natural buffers to the local community. Ecosystem-based solutions and planning interventions at landscape scale are highlighted. Read more here. Check out other cases in ‘Landscape scale Disaster Risk Reduction’ series here. Green infrastructure, as a new way to manage urban flood risk, faces challenges of attracting investment. This latest report discusses how stormwater managers can work with market forces and apply ‘economic instruments’ to address the lack of financial support. Read the full report here. In this book, researchers have introduced a comprehensive catalogue of tree species together with their ecosystem services and a classification of the socio-cultural benefits of urban green space. It provides practical information on green urban infrastructure which could be a valuable tool for urban policymakers and planners. Review the book here. The International Training Centre of the International Labour Organization (ILO) is conducting a new course in the field of green building and construction. The course will discuss creating green jobs and green buildings as a driver of inclusive green growth. The training is going to take place on 10 – 14 July 2017, in Turin, Italy. A limited amount of partial scholarships is available. The application deadline is 09 June 2017. More details could be found here.